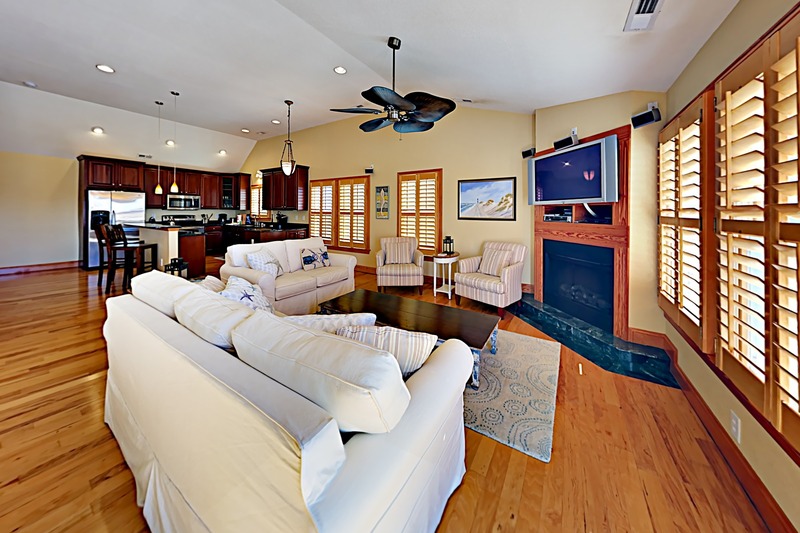 Ridges 45 is just what you need for a relaxing vacation in the OBX. Cozy and comfortable, four bedroom home with an elevator! Pool table in the rec room for some indoor recreation. Located in The Village at Nags Head community. A great neighborhood for families to enjoy walking, running, biking and the beautiful outdoors. Walk to the sound and you can capture awesome sunsets. Enjoy the Village Beach Club amenity with its oceanfront olympic size pool and kiddie pool and tennis courts. We had a wonderfully relaxing week at R45! Overall a great property- spacious, modern, clean (could be a bit cleaner and like the other review I too noticed dog hairs), gorgeous views from back deck of sound and sunset, and quite convenient to beach and pool which we loved each and everyday! The layout was ideal for our family of 6 and we most enjoyed the top level. The pool table and bottom level wasnt used as much due to the fact that you had to access it via garage or elevator- no indoor stairs which was odd. Property was on edge of cul de sac which was safe and nice for our small children. Overall Id recommend this place to family and friends.